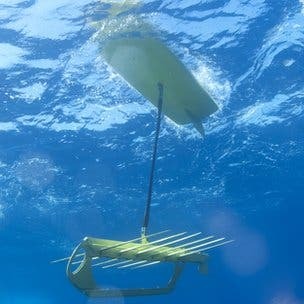 Each Wave Glider will collect valuable data about the status of the Pacific Ocean's current health. This weekend four unmanned robot vehicles set out to cross the Pacific Ocean, for the longest voyage of this kind so far attempted. During their 300 days trek, the Wave Glider crafts will gather immense data regarding composition and quality of sea water, which will provide researchers with invaluable data regarding the current status of the ocean’s health. The robots, designed by Liquid Robotics, were launched from the St Francis Yacht Club on the edge of San Francisco harbour on 17 November. Initially, the four crafts will travel together until they reach Hawaii, after which they’ll split into two pairs – one will cross the ocean towards Australia, while the other head to Japan to support a dive on the Mariana Trench (deepest part of the ocean). In total, 3,000 nautical miles (66,000km) will be covered, while curious viewers can keep up to date with the robots’ live progress on Google Earth. “Most of the ocean remains unexplored with less than 10 percent of it mapped out. This expedition creates an opportunity for students, marine researchers, and aspiring oceanographers to follow these brave Liquid Robotics ocean robots as they cross the Pacific virtually through the Ocean Showcase on the Google Earth website,” says Jenifer Austin Foulkes, Ocean in Google Earth manager. Surprisingly, the construction of the robots seems quite fragile. Made out of two parts, the upper half of the Wage Glider is shaped like a stunted surfboard and it is attached by a cable to a lower part fitted with a series of fins and a keel. Around 2.25 million data points will be gathered during the voyage as the unmanned crafts will pass for never before surveyed waters via sensors. To power the sensors, a solar panel was installed on the upper part of the craft, in contact with the surface. For me, it’s quite remarkable how the Wave Glider will be able to withstand the torrents and vicious waves of the Pacific, but obviously the engineers who made them have to know what they’re doing. “At Virgin Oceanic, our mission is taking the next step in human exploration to the last frontier – the very bottom of our seas. I will be piloting to the bottom of the Mariana Trench to explore the deepest point of the Pacific Ocean,” says Chris Welsh, Virgin Oceanic co-founder and pilot.